Professional Guides: As the pioneer guide service on Mauna Kea we have over 50 years of combined experience on the mountain. Educational and Fun: Learn all about the island’s geography, culture and natural history from our experts. Astonishing Scenery: See surrealistic landforms, strange cloudscapes and a panorama of the night sky like no other. Excellent photo opportunities abound! Sunset at the Summit: The most dramatic spectacle in Hawaii. Trip Includes: This 7.5-8.5 hour excursion includes Arctic style parkas with hoods, a hearty and hot supper, gourmet hot beverages and convenient pick-up points. Guests should be able to hike on uneven or rocky terrain. We sometimes encounter cool, wet or muddy conditions. Because of high altitude this tour is not advised for those with respiratory, circulatory or heart conditions, pregnancy or poor health. Scuba divers should be aware of altitude dangers. No children under 16. Other tour restrictions may apply. What to Bring & Wear: Closed toe shoes, long pants and a sweatshirt or sweater. 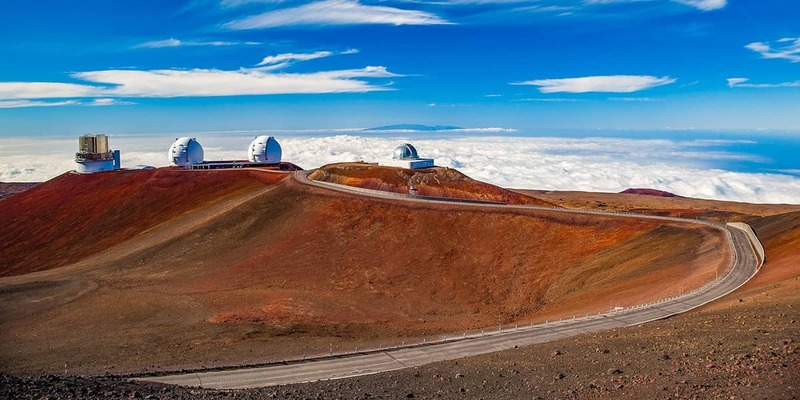 On the Mauna Kea Volcano Voyage Tour, you’ll embark on a journey from sea level to the summit of the world’s tallest (sea) mountain. It’s a truly incredible experience—one that merges the ancient Hawaiian art of navigation with our modern approach to astronomy. Average mean temperature is 32 degrees Fahrenheit or 0 Celsius.